Bay Area residents will be able to watch one of the moon's most remarkable displays late on the night of April 14 and early, early on the morning of April 15 when the shadow of Earth crosses the moon in a total lunar eclipse. A cosmic dance between Earth, sun and moon, this total lunar eclipse will be the first in three years to be visible here, weather permitting. When to watch: The eclipse starts at 10:58 p.m. PST. At 12:07 a.m. the total eclipse phase begins. Earth will block the sun completely until 1:25 a.m., and then the moon travels through the semi-shadow until 2:33 a.m.
Where to watch: Just go outside. You can see the eclipse from wherever you can usually see the moon. During a total lunar eclipse, Earth passes exactly between the full moon and the sun. As the celestial bodies move, the full moon enters Earth's shadow until it is completely covered. You may wonder, since the moon is constantly orbiting around the Earth, why there isn't a lunar eclipse every month. "It turns out the orbit of the moon is tilted relative to the orbit of the Earth around the sun so it doesn't happen regularly," says Andrew Fraknoi, Astronomy Department Chair at Foothill College. "Only when the two orbits cross—the orbit of the moon around the Earth and the orbit of the Earth around the sun—can you have an eclipse." For a visualization of what will be happening in space, check out this animated video from NASA, explaining the movements of celestial bodies during the total lunar eclipse on June 15, 2011. Late on the night of April 14, the moon will have risen far above the horizon line when it enters Earth's shadow, so the timing of this eclipse will make it remarkably accessible. "If it's clear Monday evening and Tuesday morning," Fraknoi says, "there should be a spectacular eclipse, pretty high in the sky so that anyone with a good view of the sky can see it." If you'd like to join a large watching party, you can grab at ticket for the viewing event at the Chabot Space and Science Center or perhaps gather with neighbors on a hill near your home. In the Bay Area, the eclipse will start at 10:58 p.m., when the moon enters the penumbra of Earth, or the semi-shadow. Then at 12:07 a.m., the moon enters Earth's umbra, directly in line with the sun, and the total eclipse phase begins. Earth will block the sun completely until 1:25 a.m., and then the moon travels through the semi-shadow until 2:33 a.m., when it finally emerges again to reflect the sun's light. The whole event will last 3 hours and 35 minutes. The moon during a total lunar eclipse is also called a "blood moon" because, rather than turning dark when Earth's shadow passes over it, the moon turns a rusty red or brown. That color comes from the rays of sunlight peeking around the edges of Earth, through its atmosphere. Colors with a shorter wavelength, like the blues, scatter as they hit Earth's atmosphere, whereas colors with longer wavelengths like red, bend and reach the moon, casting a reddish glow across its surface. A rich color also tells us there are a lot of particles thickening the atmosphere. "The more sooty the atmosphere," Fraknoi says, "the better this reddening effect." There's actually an eclipse season roughly every six months when it's possible to see either a solar or a lunar eclipse. This total lunar eclipse is the first of four in a row, what astronomers call a tetrad. 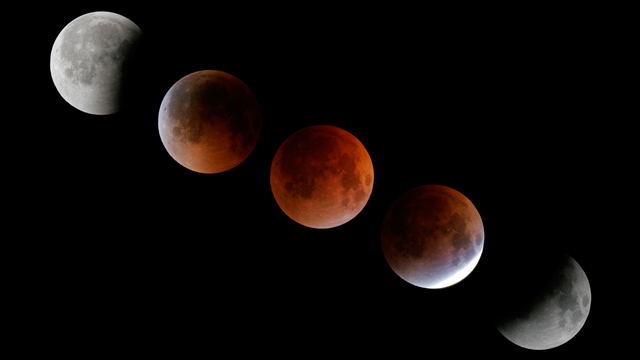 The other three total lunar eclipses will occur on October 8th, 2014, April 4th, 2015, and September 28th, 2015, and all will be visible in the Bay Area. Get your fill because after that, the next total lunar eclipse won't occur until 2018, and we won't see another tetrad until 2032-33.